. 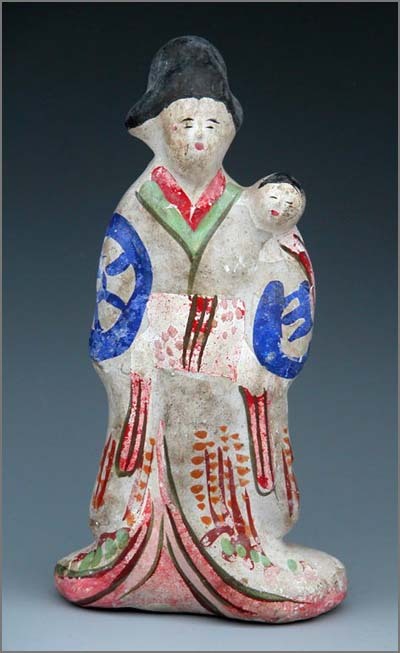 Sadogashima 佐渡島 Sado Island folk art - Introduction . Niigata has 16 items listed as "traditional craft products". Started by craftsmen from Fushimi Kyoto around 1806. There are about 20 different figures. 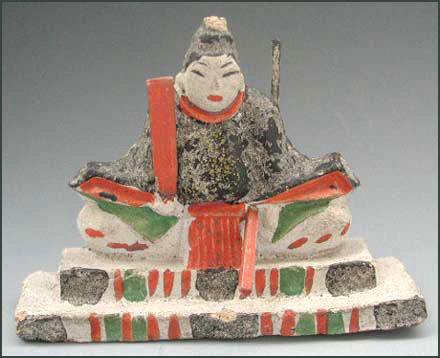 The forms from clay are dried for about one dy, then painted with colors mixed with some laquer (urushi 漆). Mostly in red, blue, black and ultramarin. 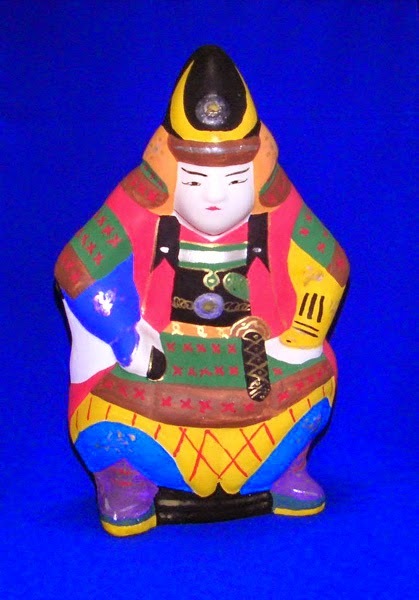 From the 下越地方 Kaetsu region (Lower Echigo). 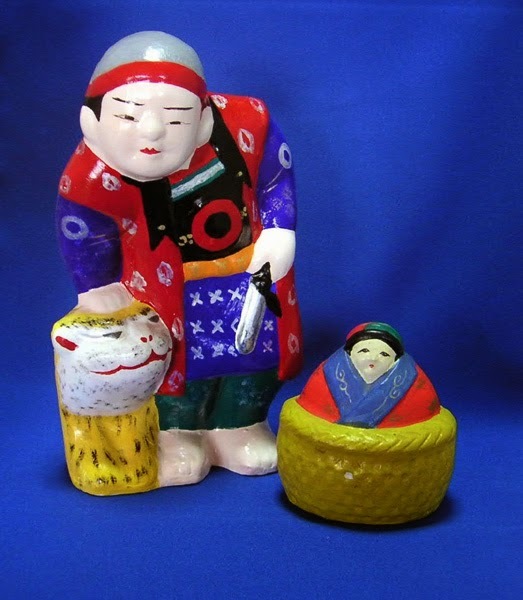 Made by 今井徳四郎 Imai Tokushiro, the Old Man of Local Children's Toys. He made them until he was 100 years old. Some legends say that in the hamlet around 平丸 Hiramaru many samurai of the Heike clan 平家の落人 settled in hiding. uri no ki ウリの木 / 瓜の木 Alangium platanifoliumvar. The bark of the tree is scratched off and let dry for a long time. 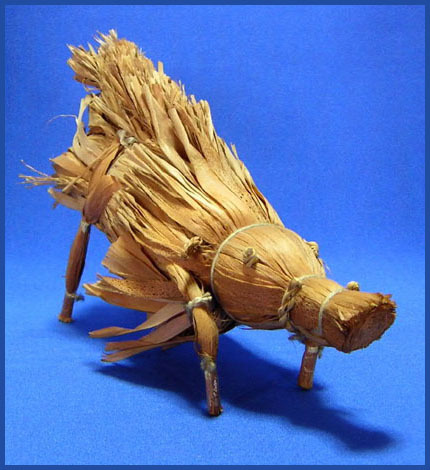 It is then fixed on a body of straw.
. suge saiku すげ細工 handicraft from sedge . 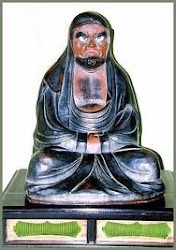 Made at the end of the Edo period by 村田多平 Murata Tahei. Tahei had been to Kyoto to learn about dyeing techniques. The production went on till the sixth generation. Made by the Honma family 本間由蔵、元吉、亀吉 Father Yoshizo and sons Motokichi and Kamekichi. 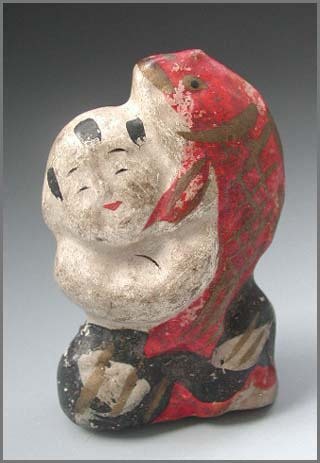 They also made normal clay tolls.
. Kashiwazaki ningyoo 柏崎人形 dolls from Kashiwazaki .
. taiguruma 鯛車 carp on wheels . They are now almost extinct. 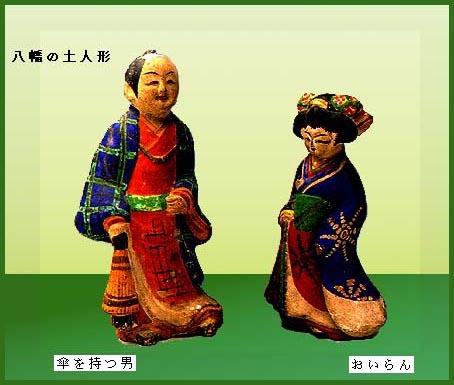 They were made at the end of the Edo period under the influence from the same dolls in Hekinan, Aichi by a craftsman who had moved to Murakami. 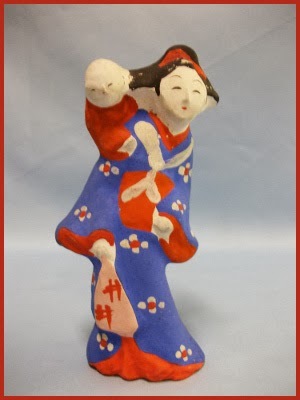 Murakami tsuchi ningyoo 村上土人形 Murakami clay dolls. 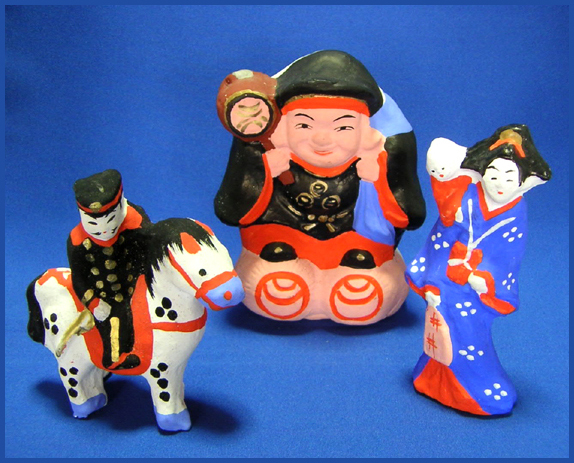 They are more colorful than other clay dolls from Niigata. 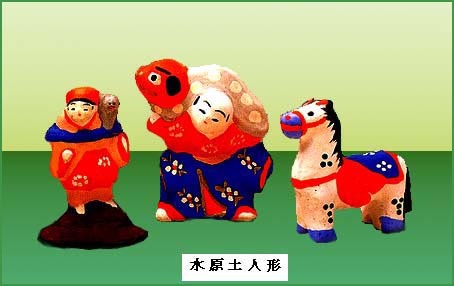 These dolls are decorated for the seasonal festivals in the third and fifth lunar month.
. Oohama tsuchi ningyoo 大浜土人形 clay dolls from Ohama - Aichi .
. Shimosukebuchi Tenjin 下助淵人形 - 天神 Murakami .
. taibonbori, tai bonbori 鯛ぼんぼり lanterns with sea bream pattern .
. kingyo daiwa 金魚台輪　goldfish on wheels .
. wara uma 新潟のわら馬 / 藁馬 / 稲馬 straw horse . A shrine dedicated to the snake deity which likes eggs. 蛇松明神 is a small shrine in the back of 白山神社 Hakusan Jinja. It sells special serpents and 土人形 clay dolls as amulets. This kite has a very stable flightvperformance, even if its shape is rather special. 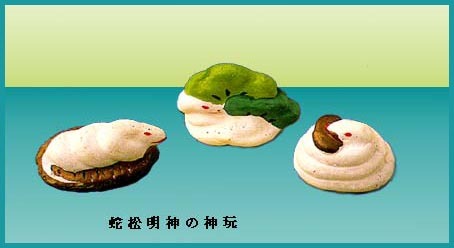 Made by 春日礼智 Kasuga Reichi, but after his death, the craft died out. 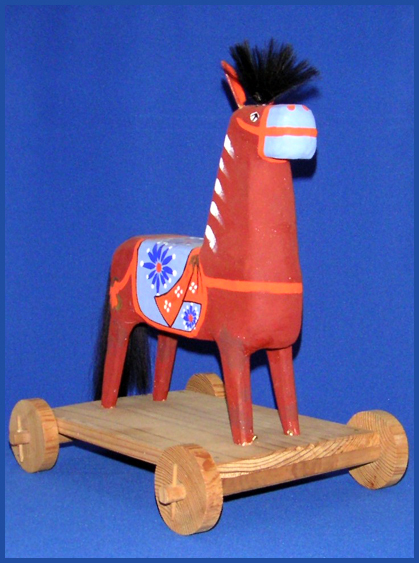 Children used these bulls to play "bull fighting". The horns are especially large. Bullfighting is still done in 山古志村の池谷闘牛 Yamakoshi village. 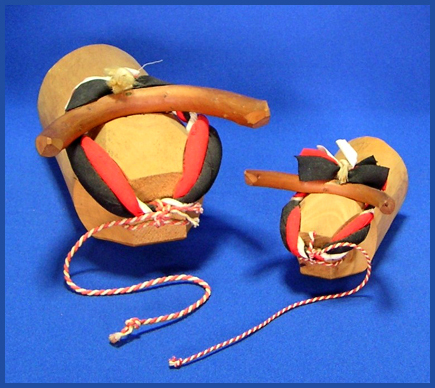 “Tsunotsuki” of Yamakoshi Village (current Nagaoka City) in Niigata Prefecture is the only tsunotsuki that has been selected as the nation significant intangible folk cultural asset. It is known as the only tsunotsuki that does not determine victory or defeat and has been given the status of a Shinto ritual that carries the meaning of dedication to the village shrine. In spite of the name “tsunotsuki,” it is characterized by drawing the match when each of the bulls exerts its strength or when their movement stops. Men called “seko” play an important role in the matches. A large number of sekos pull the rope tying both bulls, and the master seko holds the still enraged bulls’ nose, which is their vulnerable spot, and stop their fight. When they come to a complete stop, the crowd gives a thunderous applause to the bulls’ exciting fight and the sekos’ courage. The tsunotsuki match ends here. The sekos’ performance is the unique appeal of Echigo Togyu. The culmination of the men and bulls’ power, skill, and courage is harmoniously combined with the history and local culture, and a dynamic beauty beyond expression is present.
. ushi no tsuno tsuki 牛の角突き getting the horns to clash . Once a young man went to a bullfight in Niigata, where he met a beautiful girl and fell in love immediately. She took him to a large estate in the mountains, where they spent some time together in a room where they could enjoy the four seasons. He also found a room with a plum tree and nightingale decoration, but that was off-limits for humans and everything just vanished before his eyes. 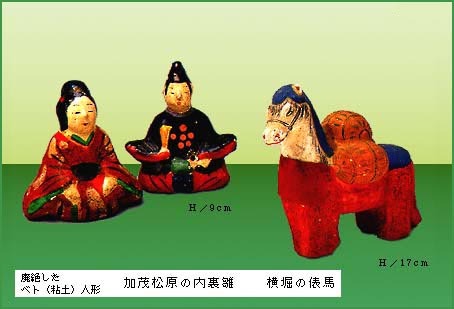 Some doll makers from Sanjo : 小林三六，野水，藤倉. They discontinued in the Taisho period.
. Ojiya tsumugi 小千谷紬 Ojiya pongee .
. Shiozawa tsumugi 塩沢紬 Shiozawa Pongee . ROKU means six -- Kaku means corners. 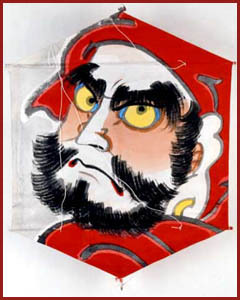 Another Japanese fighting kite and flown at the Shirone Kite Festival each May. Teams of kite fliers gather on both river bank and try to entangle their flying lines then proceed to cut each others kites lines or pull the kites to their side of the river. Normally decorated with famous warriors, folk heroes or advertisement. It makes a noise like patapata / petakuta when the plates fall down.
. Tsubame Tsuiki Dooki 燕鎚起銅器　Tsuiki Doki : hammered metal ware . Reference mentions bronze or copper as the main material used. Mad in the 栃尾市栃堀地区 Horichi district of Tochio city. 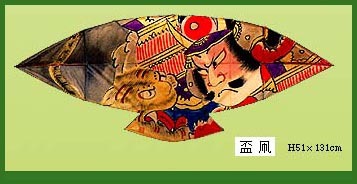 Many have a slight red touch above the eyes.
. Urasa no neko men 浦佐の猫面 cat masks . Torrential rain in Niigata and Fukushima prefectures in northern Japan has caused rivers to overflow, raising the danger of landslides. Authorities have issued an evacuation order, or advisory, to about 296,000 people in 21 municipalities. In Niigata's Sanjo City, more than 10,000 people were ordered to evacuate after a dike collapsed. A 67-year-old man in Niigata Prefecture was found in a stream and later confirmed dead. 5 people are missing in the region. Since Wednesday, more than 650 millimeters of rain has been recorded in some parts of Fukushima. 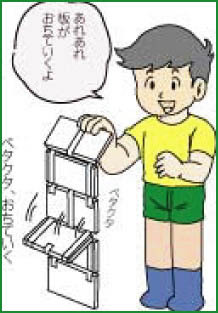 Sanjo City in Niigata has gotten more than 1,000 millimeters. The Meteorological Agency is calling on people to be on the alert for floods, landslides, lightning, and strong winds. We watched reports on the news today all day long - this is terrible, brings back memories of the tsunami in Tohoku on March 11, 2011.
. Niigata Folk Toys - this BLOG .